Download "Key Benefits. State-of-the-art agency management platform provided as a fully hosted Solution-as-a-Service"
2 TAKE CONTROL: DO IT YOUR WAY! You can leverage the power of the pre-configured system but take control and customize it to meet your business needs. Custom Company Logo Custom Color Scheme Nexsure allows small agencies to provide anytime anywhere services; not just when they have their computer and internet connection, but anytime they have their Smartphone or their pad or tablet. Over 60% of independent agents are considered by the industry to fall into the Small Agent category. It is the technological advances like those provided with Nexsure that allow this 60% to compete day in and day out, not just as business is done today, but more importantly, how business will be done tomorrow. Craig Faust Controller, Consolidated Agency Partners, Inc. COLOR SCHEMES It is your system; make it look the way you want. Select a color scheme that matches your company s logo and letterhead. EMPLOYEES Comprehensive employee file with the ability to track detailed information, salutations, digital signatures and even a photo. Use the digital signatures on applications, binders, certificates and Microsoft Word documents. COMPANY LOGO Upload your company logo in seconds, and the system will display your logo to all users that access the system. EXTERNAL LINKS (elinks) Extend the menus in the system to external Web sites that you and your team need to access frequently. 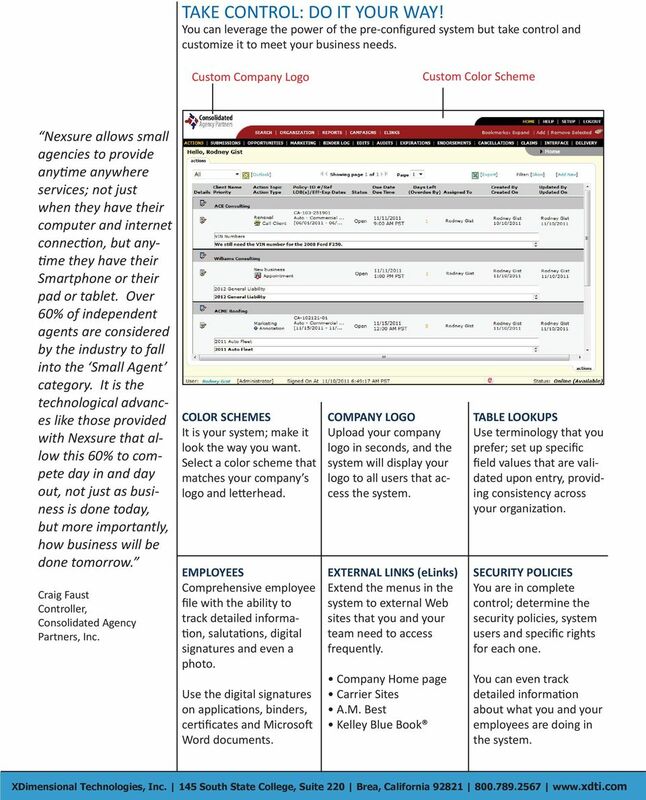 Company Home page Carrier Sites A.M. Best Kelley Blue Book TABLE LOOKUPS Use terminology that you prefer; set up specific field values that are validated upon entry, providing consistency across your organization. SECURITY POLICIES You are in complete control; determine the security policies, system users and specific rights for each one. You can even track detailed information about what you and your employees are doing in the system. 3 SALES: FOCUS ON THE BEST OPPORTUNITIES! Enter Sales Opportunities; qualify, track and record progress. When ready to quote, promote the Opportunity to a marketing record. Advanced Search Criteria Detailed results which includes quick navigation to the client record, assignments, Opportunity details and contact details. Report on the sales funnel to find your best Opportunities. Application Navigation Tree Includes industry standard ACORD as well as carrier specific forms. 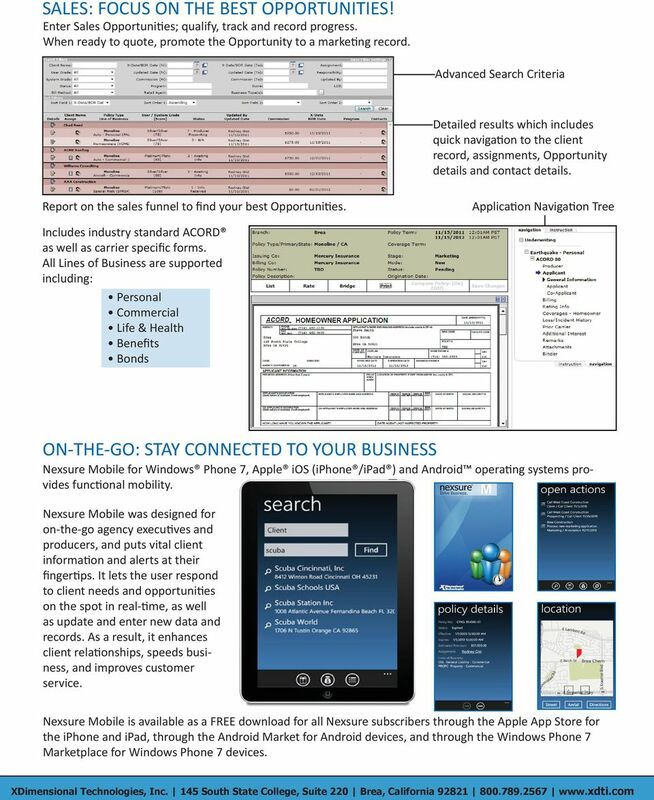 All Lines of Business are supported including: Personal Commercial Life & Health Benefits Bonds ON-THE-GO: STAY CONNECTED TO YOUR BUSINESS Nexsure Mobile for Windows Phone 7, Apple ios (iphone /ipad ) and Android operating systems provides functional mobility. Nexsure Mobile was designed for on-the-go agency executives and producers, and puts vital client information and alerts at their fingertips. It lets the user respond to client needs and opportunities on the spot in real-time, as well as update and enter new data and records. As a result, it enhances client relationships, speeds business, and improves customer service. Nexsure Mobile is available as a FREE download for all Nexsure subscribers through the Apple App Store for the iphone and ipad, through the Android Market for Android devices, and through the Windows Phone 7 Marketplace for Windows Phone 7 devices. 4 CUSTOMER SERVICE: EMPOWER YOUR TEAM Nexsure provides a comprehensive customer service solution that is simple to use and customizable to meet your business needs. 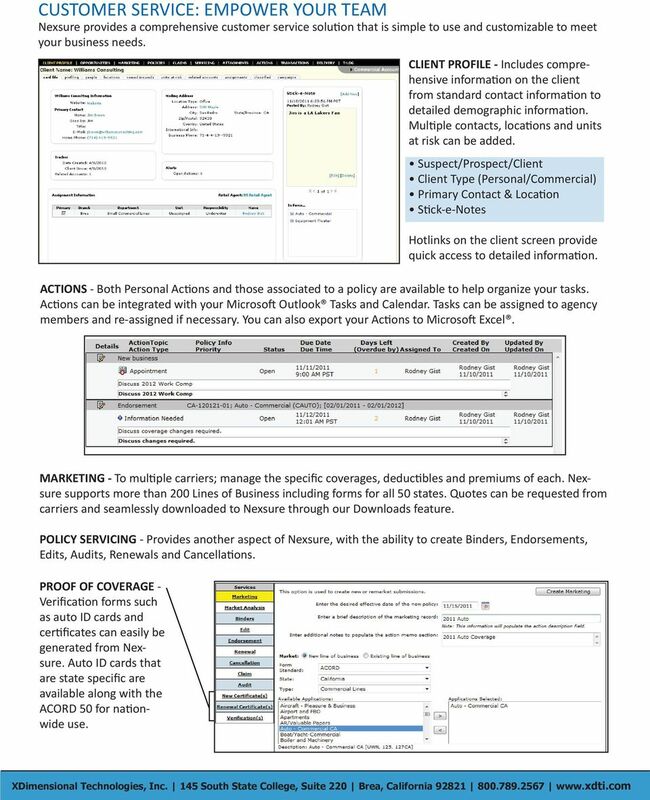 CLIENT PROFILE - Includes comprehensive information on the client from standard contact information to detailed demographic information. Multiple contacts, locations and units at risk can be added. Suspect/Prospect/Client Client Type (Personal/Commercial) Primary Contact & Location Stick-e-Notes Hotlinks on the client screen provide quick access to detailed information. ACTIONS - Both Personal Actions and those associated to a policy are available to help organize your tasks. Actions can be integrated with your Microsoft Outlook Tasks and Calendar. Tasks can be assigned to agency members and re-assigned if necessary. You can also export your Actions to Microsoft Excel. MARKETING - To multiple carriers; manage the specific coverages, deductibles and premiums of each. Nexsure supports more than 200 Lines of Business including forms for all 50 states. Quotes can be requested from carriers and seamlessly downloaded to Nexsure through our Downloads feature. POLICY SERVICING - Provides another aspect of Nexsure, with the ability to create Binders, Endorsements, Edits, Audits, Renewals and Cancellations. PROOF OF COVERAGE - Verification forms such as auto ID cards and certificates can easily be generated from Nexsure. Auto ID cards that are state specific are available along with the ACORD 50 for nationwide use. 6 CARRIER DOWNLOADS: POLICY & COMMISSION Policy and commission Downloads from carriers are directly linked to Nexsure. 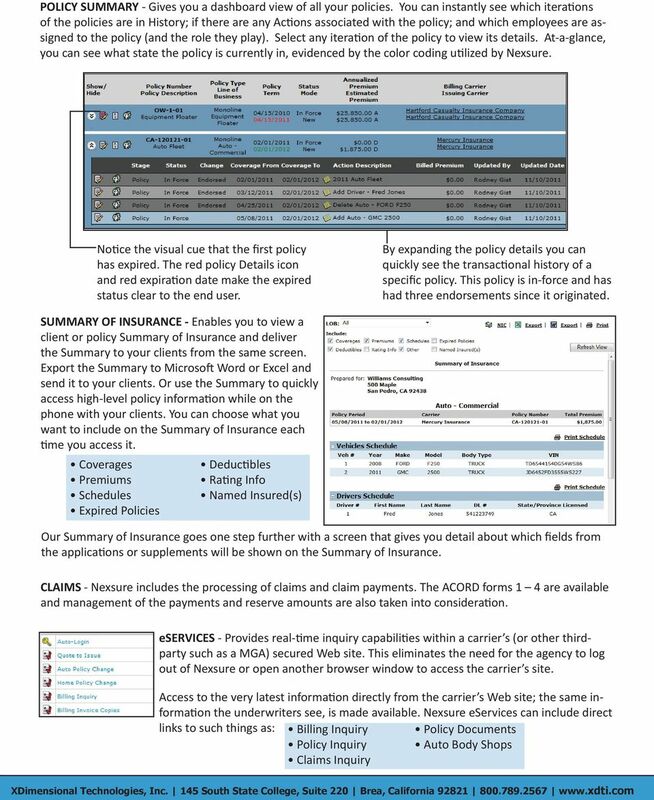 Each day Downloads can be processed in Nexsure to add and/or update policies and commissions for your staff. Default Download rules can be set for each branch of your business to help process your information. Nexsure takes advantage of IVANS mailboxes but also supports carriers that do not use the traditional model. To connect to IVANS simply enter your account information and thats it! There is no software to install or manage. RATING: READY SET RATE! Nexsure Rating can be used to acquire both comparative and real-time quotes. Nexsure enables you to work with your preferred rating company to get the real-time quotes without ever having to leave Nexsure. You can request quotes from one or more carriers through rating in Nexsure. Seamless integration with rating companies reduces administrative costs and permits faster, better communication among brokers, agents, and insurers. Our comparative rating partners are: ACS2000 Capital EZLynx LexisNexis SeaPass WinFSC SEMCAT Custom DOCUMENT MANAGEMENT: AS CLOSE AS THE INTERNET! 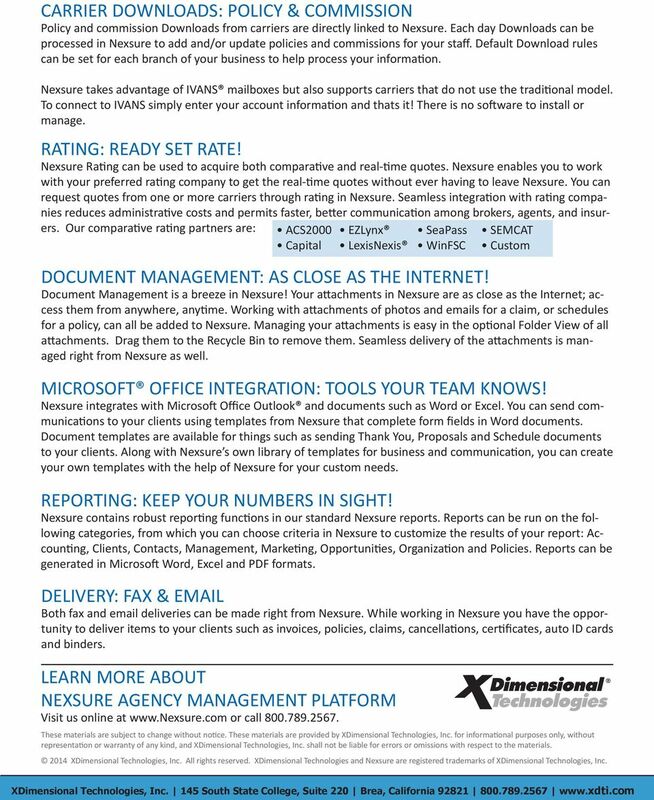 Document Management is a breeze in Nexsure! Your attachments in Nexsure are as close as the Internet; access them from anywhere, anytime. Working with attachments of photos and s for a claim, or schedules for a policy, can all be added to Nexsure. Managing your attachments is easy in the optional Folder View of all attachments. Drag them to the Recycle Bin to remove them. Seamless delivery of the attachments is managed right from Nexsure as well. MICROSOFT OFFICE INTEGRATION: TOOLS YOUR TEAM KNOWS! 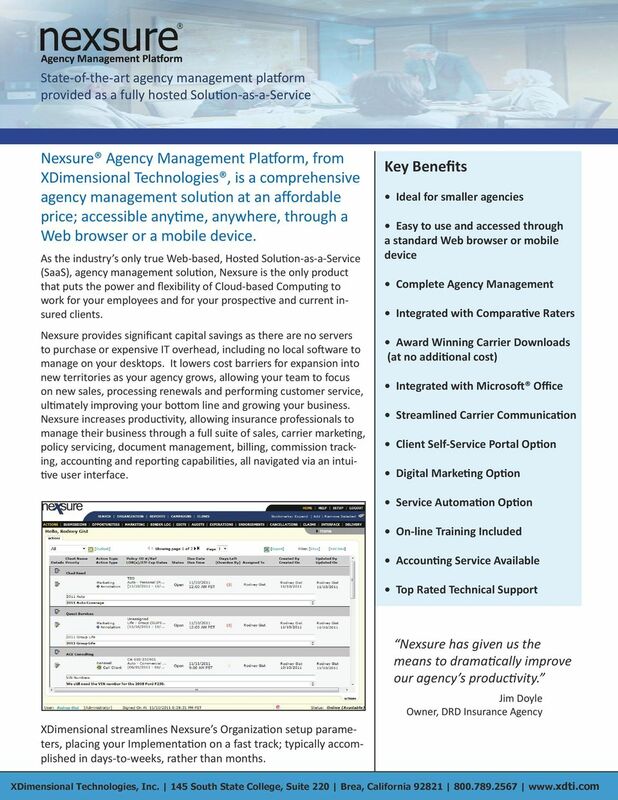 Nexsure integrates with Microsoft Office Outlook and documents such as Word or Excel. You can send communications to your clients using templates from Nexsure that complete form fields in Word documents. Document templates are available for things such as sending Thank You, Proposals and Schedule documents to your clients. Along with Nexsure s own library of templates for business and communication, you can create your own templates with the help of Nexsure for your custom needs. REPORTING: KEEP YOUR NUMBERS IN SIGHT! Nexsure contains robust reporting functions in our standard Nexsure reports. Reports can be run on the following categories, from which you can choose criteria in Nexsure to customize the results of your report: Accounting, Clients, Contacts, Management, Marketing, Opportunities, Organization and Policies. Reports can be generated in Microsoft Word, Excel and PDF formats. DELIVERY: FAX & Both fax and deliveries can be made right from Nexsure. While working in Nexsure you have the opportunity to deliver items to your clients such as invoices, policies, claims, cancellations, certificates, auto ID cards and binders. LEARN MORE ABOUT NEXSURE AGENCY MANAGEMENT PLATFORM Visit us online at or call These materials are subject to change without notice. These materials are provided by XDimensional Technologies, Inc. for informational purposes only, without representation or warranty of any kind, and XDimensional Technologies, Inc. shall not be liable for errors or omissions with respect to the materials XDimensional Technologies, Inc. All rights reserved. XDimensional Technologies and Nexsure are registered trademarks of XDimensional Technologies, Inc.
Insurance was never like this before! MAX Anywhere. Take MAX anywhere the action is. Single Sign-On is all GrOWn up. Sales Rabbit Integration Sales Rabbit (http://www.salesrabbit.com/) is a smartphone app (ios and Android) tailored for door-to-door sales. This is a popular sales technique for some pest control companies. Choose your mobile device carefully. The wrong platform could leave you without key functionality. 2014 TSS Software, a Division of First American Professional Real Estate Services, Inc.
A Single System to Streamline Your Project Based Operation. 2014 Corecon Technologies, Inc. All rights reserved. Sample- for evaluation purposes only! Outlook Web App. TeachUcomp, Inc. A Presentation of TeachUcomp Incorporated. Copyright TeachUcomp, Inc.